Tropical Storm Don - T-Storms - Unrelenting Heat. 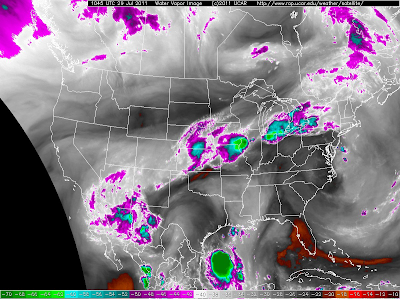 Water Vapor Satellite Image At 4:45 AM MDT. outflow boundaries from yesterday's crop of t-storms. 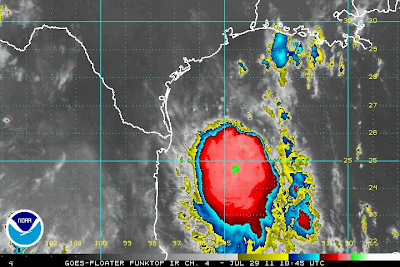 NHC IR Satellite Image Of TS Don At 4:45 AM MDT. 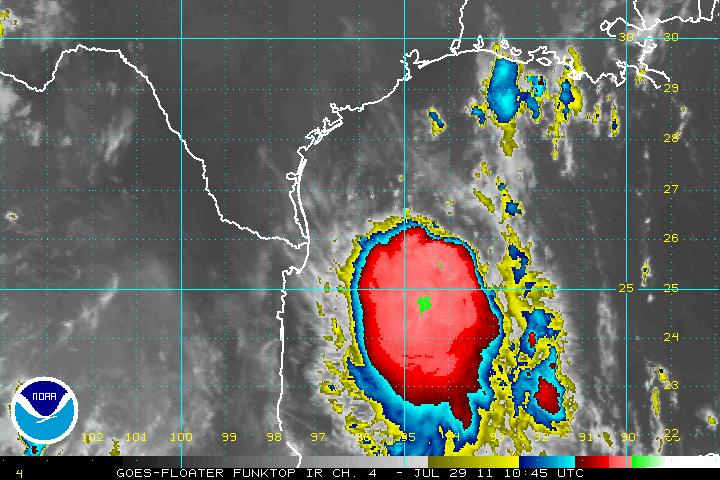 Atlantic Floater 1 (Funktop) Image Of TS Don At 4:45 AM MDT. NWS HPC 1 -3 Day Precipitation Forecast. Valid 6 AM Today - 6 AM Monday. strengthening today, before making landfall between Corpus Christi, and Brownsville,Texas late tonight or early Saturday morning. 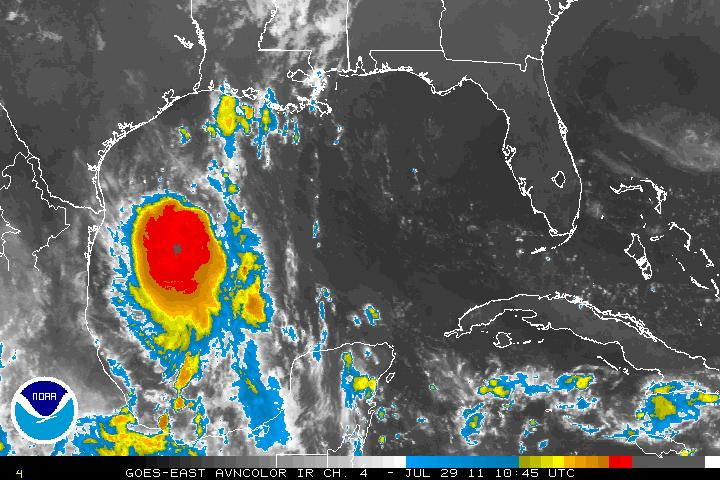 Don has struggled to strengthen the past 24 hours because wind shear, and dry air over the Gulf of Mexico, has been wrecking havoc with his structure. This has prevented him from becoming a Hurricane, in spite of the warm waters that he is over. For awhile yesterday, he was moving in a southwesterly direction, but has resumed a course back to the west-northwest. This should continue today. 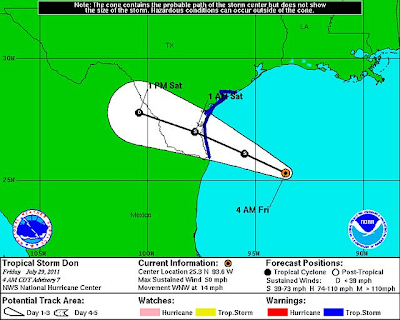 Don's Potential Impacts Upon W TX & SE NM? Most of the models are now forecasting Don to take a track a little further to the south than was originally indicated.The only fly in the ointment is the European model (ECMWF), which wants to track Don more to the northwest than the other models. As of the 3 AM MDT Advisory, the National Hurricane Center was discounting this models forecast track, and sticking with the general consensus of the other models. If, (here is that big word again) the current forecasts, and trends of the future track of Tropical Storm Don pan out as the models are forecasting, then W TX and SE NM will only get a glancing blow from the remnants of Don late this weekend. I must admit that I have some reservations about the forecast track of Don this morning. 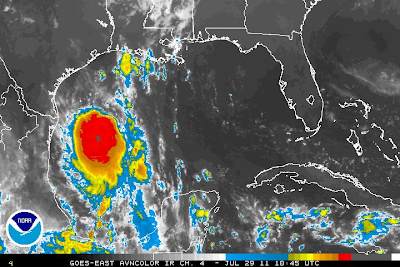 I don't think that we can completely rule out the possibility that the remnants of Don may impact our area more than what the models indicate.Tropical Storms and Hurricanes are notorious for not playing by the rules sometimes, and are one of the hardest meteorological phenomena to forecast. Again, I think its a little early to know exactly for sure just how much Don will, or will not impact our area. We can expect to see some of his remnant moisture get en-trained into the area late this weekend, and possibly continue into next week. To what extent is still a little uncertain at this time. Should his remnant moisture stay off to our south and west as the latest model runs, and forecasts indicate, then we will see less rainfall over the area, and less of a threat for flash flooding. 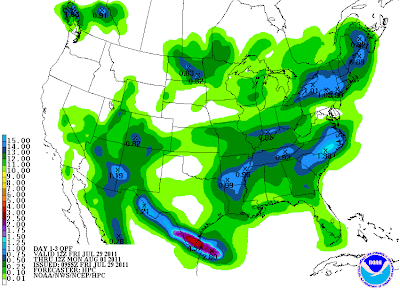 If the remnants of Don move further northwestward than currently is being forecast, and the area should take more of a direct hit from his remnant moisture, then the threat for heavy rainfall, and flash flooding would increase late this weekend into the first of next week. Looking at the Satellite Water Vapor loop this morning, an upper level tropical low can be seen over Chihuahua, Mexico. This feature is forecast to continue moving off to the NNW today, and will be located over the mountains of SE NM by this evening. Outflow boundaries from yesterday's afternoon and evenings crop of t-storms are draped over the area this morning. These features will combine with the strong afternoon heating, and mountainous terrain, to produce scattered t-storms across the area. Locally heavy rainfall along with localized flash flooding, may occur with some of the heavier t-storms this afternoon and evening, especially over and near the burn scar areas. With the slight increase in moisture and more t-storms roaming around the area today, we should see our afternoon high temps reach the upper 90's to near 100 today into the weekend. If the models are correct, then very hot weather may return to the area the first of next week into at least the middle of the week. High temps could flirt with the 110-degree mark over parts of SE NM and W TX by the middle of next week.